Though not technically a YA book, this was recommended to me by my English teacher, and both my mother and I zipped through it in a day! This is one of those books that transcends YA or Adult boundaries--definitely check it out! It is 1946 and Juliet Ashton is looking for an idea for her next book. She found wonderful success during World War II writing humor pieces to distract fellow British citizens from the horrors of war, but now she wants to write something different. A letter from someone she doesn't even know might give her the inspiration she need. As Juliet and Dawsey Adams, a resident of the island of Guernsey, which was occupied by the Nazis during the war, correspond, Juliet discovers a group of brave people whose love for reading and each other helped them survive the horrors they faced. But when she travels to Guernsey, she'll discover far more than that. 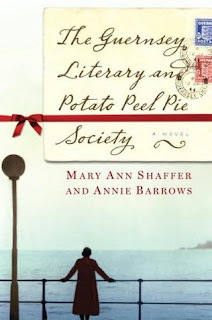 The Guernsey Literary and Potato Peel Society is one of those unexpected reads that will completely capture the attention of readers and transport them completely into the story. The novel is told in a long series of letters, which may be a turn off for some, but the sharp and sometimes subtle humor in them will capture readers' hearts by page five. The characters are all very colorful and diverse, and each one shines through their own words and passions. The citizens of Guernsey and how each of them discovers a love of reading is wonderful to read, and their pain of the loss of property, family, and friends through the occupation of their home is heartrending. Full of wisdom and courage and love and heartbreak, The Guernsey Literary and Potato Peel Pie Society will teach you something about history, about literature, and about human nature. This is a definite must-read. I loved this book. It is especially great in audio. I've seen this book in the bookshop today ^O^!! Mary Ann Shaffer used to work at my public library! I saw her all the time, she was so sweet! Bookworm: That's cool! I was so sad to see that she died when I picked up the final version of the book last week! I was really looking forward to some more books by the both of them! I just read this this week and WOW, I loved every second of it. I worked in a bookstore with the author, Mary Ann Schaeffer, during college. When I saw her name on the book and confirmed that it was the same Mary Ann, I was so excited! She was wonderful! I was so sad to discover that she'd passed away before the book was published. This was such a lovely, moving read. Great recommendation.